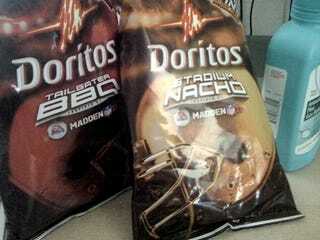 A week ago Friday I reviewed the Madden NFL Doritos - in summary, Nacho Stadium Good; Barbecued Tailgater bad. Most everyone thinks Frito-Lay could have done a better job with the flavors. Let's give them some tips! Because if there's one thing gamers know, its calorie-loaded junk food, amirite? Your task today, create a new "video game-inspired" flavor of Doritos, or any snack, or depict them being consumed in some kind of video game. As Funyuns are included in the source image set, that means, yes, feel free to get Kirby high. And that Pringles logo is oh-so-exploitable. But haven't we put Bobby Kotick's face on enough products? There are other guys out there, you know. Jack Tretton? Peter Moore? Molyneux? Cliffy B? You know the rules: There really aren't any, except DON'T MAIL THEM TO ME. Post them IN THE COMMENTS BELOW. But these, of course, are just starting points, so if I didn't use your favorite brand or an exploitable-enough image, run go get it and show me who's boss. The best 20 will be rounded up in a gallery on Saturday. See you next week!